For many credit unions, the call center plays an extremely important role in the organization. With a unit as important as the call center, selecting the right metrics to monitor is vital. "Our call center does it all…from loans to Internet banking resolution!" listeners who fulfill members' wants and needs." "Our call center is the heart of the organization"
Average Handle Time -- This is a measure of talk time and after call work. Many credit unions look at this measure, but do not set a goal to it. Quality Assurance in member interaction. This is usually run through training or audit department. Expense or Revenue per call -- Does the call center drive member relationships? Sales Production - Credit unions are setting goals based on the products that call center agents can actually have an impact on. Service level – What is right goal? 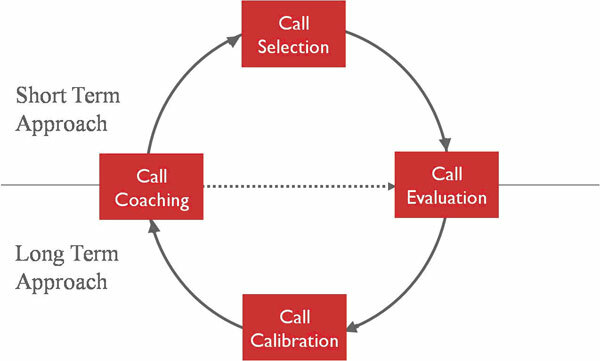 The call center strategy is the most important factor in selecting service level. Service level goals should impact staffing levels, skill based routing, scheduling and the member's perception of the call center. There are extremes in service level. For example, 911's service level is 100% of calls answered in 0 seconds. 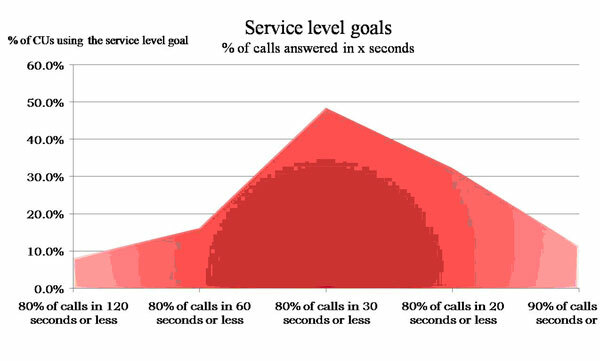 A software company help desk may have a service level of 60% of calls answered in 240 seconds. According to the call center survey, credit union's service level goal falls in the middle of the extremes. Credit unions are typically striving for a service level of 80% of calls answered in 30 seconds or less. Below is an area chart that shows credit union goals in service level. The service level goal in the call center needs to match the credit union's overall strategy for its call center. Source: 2008 Credit Union Call Center Survey. You Measured the Call Center …Now What? Measurement is important. Turning the metrics into action is vital. Most credit unions use coaching and training programs in combination with their measurement and goal setting programs. Below is one credit union's approach to the call quality program within in the call center. The credit union has a call quality program that includes scoring five calls per call center employee each month. There are several managers involved in the scoring process, so call calibration needs to be done periodically to make sure everyone is scoring based on the same criteria. Also, each employee is coached once per month and the manager and employee listen to certain recorded calls together. Monthly training programs and a monthly call center training newsletter are then developed based on the call quality program. Hi Sharon, we have worked with thousands of call centers and many Credit Union call centers. I think we can help you with this. Can you send me your contact information? I was looking for some information on what other call centers track, and i was happy to see we are right there with everyone else! Great information. I am a new Manager in our Call Center so I appreciated this type of information. Good breakdown on call center metrics. Helpful to see the call center and employee metrics. Ray: The information you have provided here is good. It provides some of the fundamental metrics used by call centers around the world. As they say, if you can’t measure it you can’t manage it and it is important for all call centers to proactively manage within market-leading service levels to effectively differentiate themselves beyond product and price. I am always amazed when we run across credit unions that are fine with measuring the critical metric of time to respond to member emails in clock hours rather than business hours, since clock hours is meaningless unless they run a 7x24 hour shop. Sometimes I just wonder if the call center manager is more concerned about their accountability than what is best for the credit union and member. It is also worth pointing out that several industries outside of credit unions have been actively managing contact centers in a multi-channel world for much longer than credit unions and I would encourage member care professionals to engage with groups outside the credit union space to benefit from the experiences of these more mature markets. We are looking into options for starting a Call Center. We are a small Credit Union, approximately 20,000 members. Can you advise best way to start?